The Mini Reviewers have been back at school and nursery for a few weeks now and that combined with the distinct change of weather, means that Autumn has most definitely arrived! You may have noticed we were a little quiet over the Summer months, this was mainly because we were too busy reading as well as having a few bookish adventures of our own. Poohsticks anyone? Or perhaps a spot of Gruffalo Orienteering? 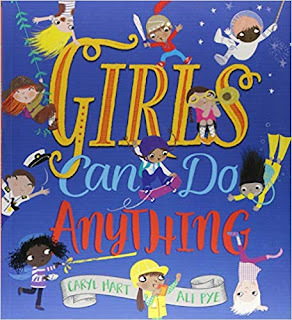 The best news is we discovered lots of exciting new books to blog about in the upcoming months, which could be perfect for your (whispers) Christmas lists! 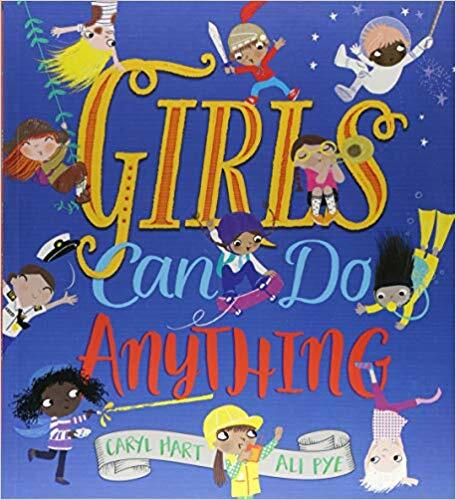 Today we are sharing our favourite six books from over the summer including a mix of chapter, picture and non fiction and let me just say that choosing them has been rather tricky indeed! 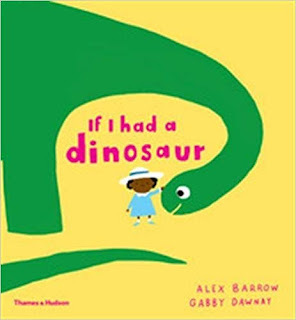 If I had a dinosaur by Alex Barrow and Gabby Dawnay and published by Thames Hudson is our first picture book choice and is a book we borrowed from the library. It is a brilliant rhyming story about a little girl who would like a pet dinosaur, I mean who wouldn't? The Mini Reviewers certainly would! In the book the little dino fan imagines all the fun things she could do with her dinosaur like take him to the park, to school and even swimming. She even wants to get a "dino-flap" so he could come inside the house for a nap. This silly story is bound to delight all little dino fanatics! "And the girl I love best in the whole world is YOU. Tell me, what will YOU do?" Mini Reviewer, Izzie (6) has selected the chapter book choices as she has done a lot more independent reading over the summer. She amazes me daily with the progress she is making. She has become quite a confident little reader now so keep it up Izzie! 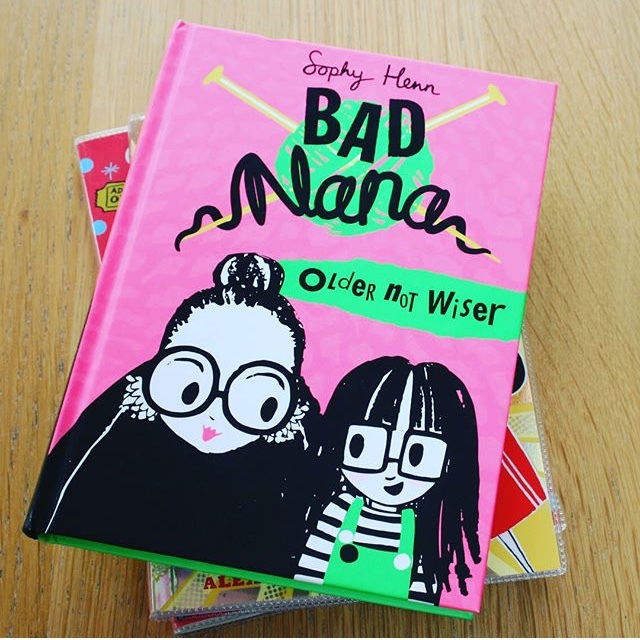 Her first choice is Bad Nana Older Not Wiser written and illustrated by Sophy Henn and published by Harper Collins. The book features Jeanie who is 7 3/4 and the funny adventures she has with her grandma who she calls "Bad Nana". The adventures are brought to life by Sophy's bold and vibrant pink/black illustrations, which really capture the imagination. Regular readers may remember that we featured this book in the six books Izzie was looking forward to reading this summer: Six Fun Books for Newly Independent Readers, well it certainly didn't disappoint us and here's why Izzie chose this book as one of her summer: "It is funny and a bit naughty and I like being cheeky! I loved the pictures because they are pink." Well you can't argue with that! Izzie's second summer choice is Magical Kingdom of Birds: The Sleepy Hummingbirds written by Anne Booth, illustrated by Rosie Butcher and published by Oxford University Press. This is the first in a new series of exciting books about a magical world of fairies and birds. Each book will feature a different bird and the first books is all about Hummingbirds. This story begins when Maya, a young girl, is transported to the magical kingdom on receiving a new colouring book, The Magical Kingdom of Birds. Unfortunately the Kingdom is in trouble as evil Lord Astor plans to capture the Hummingbirds and it falls to Maya to save them. The story is full of adventure and a touch of magic, which will definitely appeal to most little readers but what Izzie particularly liked was the bird fact file and activities at the end of the book. She is looking forward to finding out what happens in the next book. Prior to our trip to Legoland Windsor this summer we received a review copy of a brilliant Lego themed book with 20 activity ideas to teach kids about STEAM (science, technology, engineering, arts and maths). 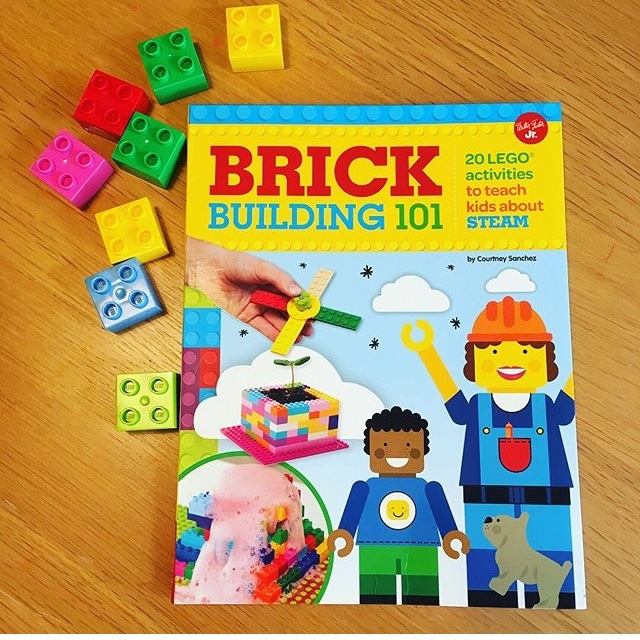 We have had a look at a variety of Lego inspired books before but Brick Building 101 has to be the best we have come across. 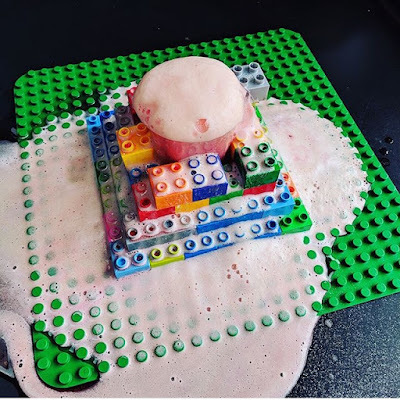 The activities are simple, don't require much parent preparation and can for the most part be carried out with a simple range of standard Lego bricks. 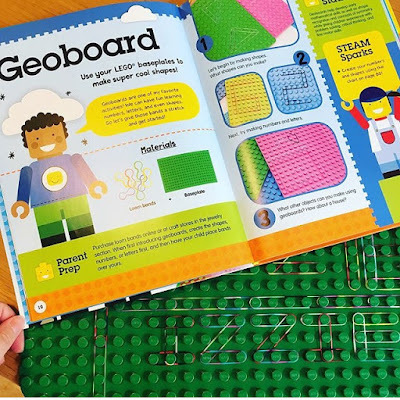 There is a great range of activities, with easy to follow instructions and photographs. 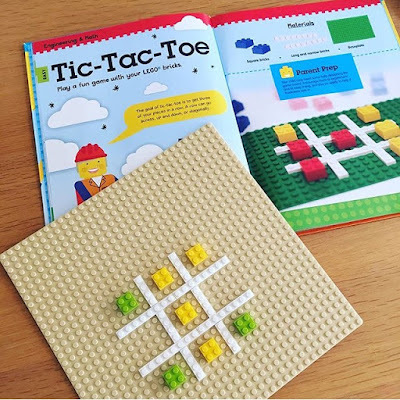 I can see that this book could be useful for teachers as well as parents as many activities could be adapted for classroom use. 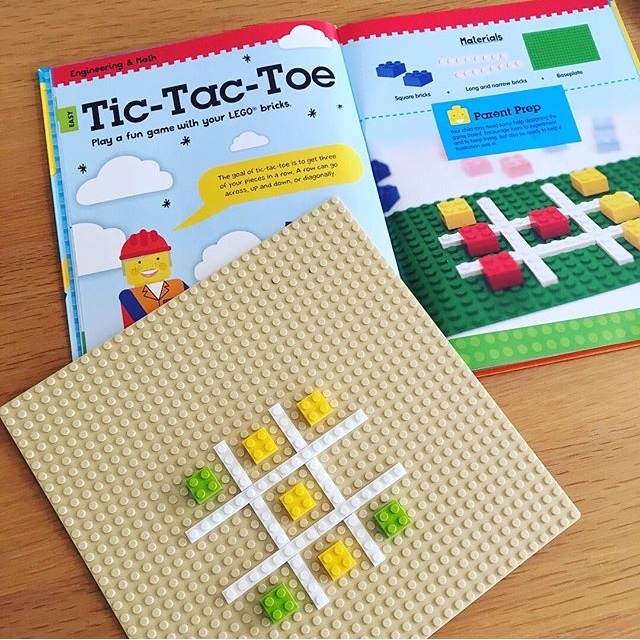 The Mini Reviewers thoroughly enjoyed all the activities we completed and are keen to try out some more. Their favourite activity so far has been the exploding Duplo volcano possibly because it was the most messy! 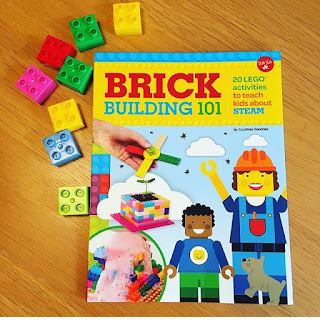 Brick Building 101 is written by Courtney Sanchez and published by Quarto Kids. 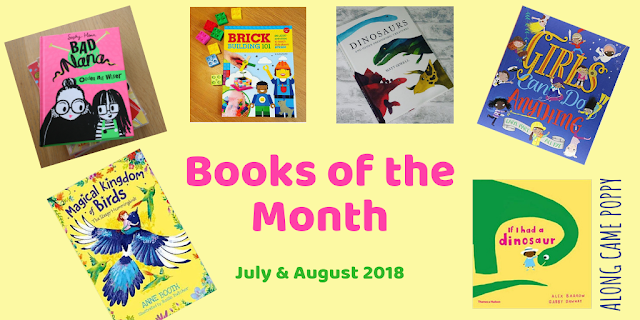 Our final favourite book of the summer is Dinosaurs and other prehistoric creatures by Matt Sewell and published by Pavilion. This is not a newly released book, we actually received our copy some time ago but the Mini Reviewers have re-discovered it this summer. They thoroughly enjoy poring over the giant pages together as they decide which dinosaur to read about next. I personally love it as the watercolour illustrations make it completely different from all the other dinosaur books we have read. Definitely one for dino fans young and old! We hope all our readers had an enjoyable Summer and we would love to know what your favourite Summer reads have been? We will be back soon with our favourite books of September. In the meantime... Happy Reading! *Disclaimer: We received copies of these books for review purposes. Apart from Bad Nana which was sent to us as a prize and If I had a dinosaur, which we borrowed from the library. All opinions are honest and as always our own.